Dungeons & Dragons, the granddaddy of roleplaying games, was introduced 40 years ago this month. Even if you've never played a game, you've probably appreciated at least a few of the ripples it generated in the cultural pond over the last four decades. I've run down a few of D&D's greatest contributions here, Buzzfeed style. (Buzzfeed is our master now. We're helpless in the face of its listicles.) Many of these cultural highlights are universal; a few are more personal. But they're all reasons why I'm grateful for the game. Advanced Dungeons & Dragons has a permanent place on my TiVo hard drive because it so perfectly skewers D&D and the Community characters themselves. It's a brilliant 22 minutes of television and also a nice peek at game play for those who aren't familiar with how it works. These were sitting like this on my basement bookshelf. Seriously. No posing. There's something about a bowl full of polyhedral dice: the smooth plastic and metal surfaces, the explosion of colors, the happy clatter as they tumble across a tabletop. You give those dice a good roll, and all's right with world. Unless, of course, they don't allow you to score a critical hit. Then they're dirty betrayers. This is one of the best monster creations to spring from D&D. It's exactly what it sounds like: An enormous block of a gelatin substance that creeps down hallways and slurps up everything in its path. 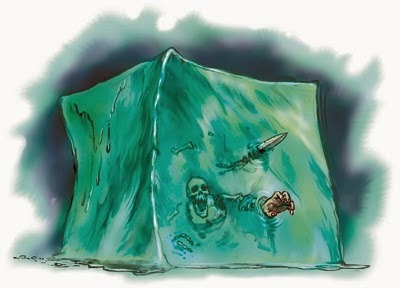 In the right setting, a gelatinous cube joke KILLS. From In the Garage: "I've got the Dungeon Master's Guide / I've got a 12-sided die / I've got Kitty Pryde / and Nightcrawler too / Waiting there for me / Yes, I do. I do." 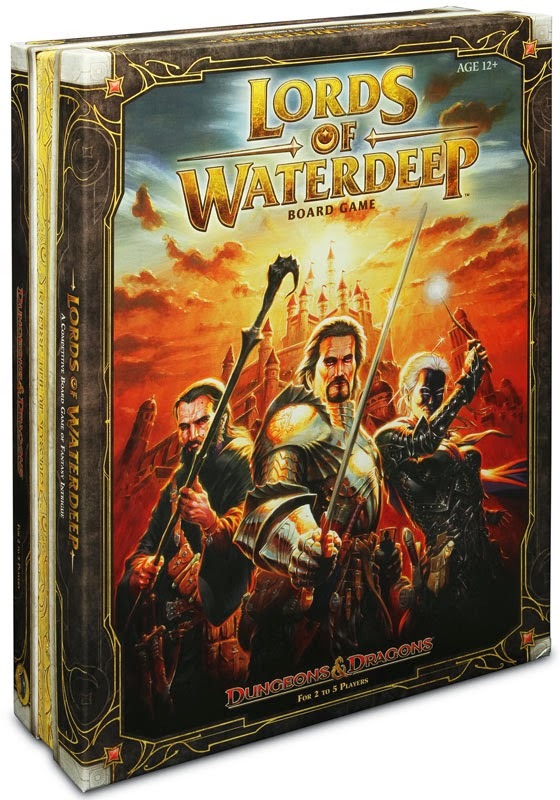 If you're looking your next game shop purchase, consider Lords of Waterdeep. It's one of my very favorites, a light worker placement-based strategy game that's built around a D&D theme. It's easy to learn and quick to addict. Veteran campaigners will even find some recognizable artwork on the cards. This game is also a fantastic mobile app from Playdek, one of the masters at converting tabletop games to smooth online play. If you download it, let me know and I'll gladly set up a game for us online. Meet my cat, Gygax. He's named for Gary Gygax, the co-creator of Dungeons & Dragons. When my husband and I were trying to decide whether to adopt him from the local animal shelter, the argument that won us over was that we'd get to name him Gygax. He's been fat and happy on our sofa ever since. The voice of the Iron Giant has played D&D since the 1970s and rocks a double-specialized Drow witch-hunter, according to this interview. This increases my affection for Diesel by at least 275 percent. Don't you kind of want to see his dice collection? I bet he keeps them in a special bag. 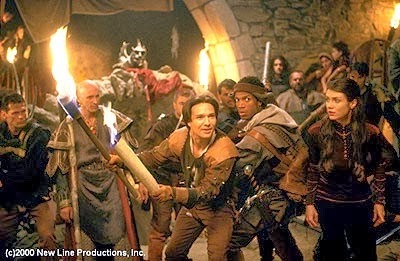 Dungeons & Dragons may just be one of the worst movies ever made. Its main contribution to our culture is the ability to say, in any situation, "This [student art film/meal with my in-laws/compound fracture of my femur] is pretty bad, but at least I'm not watching Dungeons & Dragons again." This is a worthy contribution to any society. My husband and I met in high school, and although we didn't start dating until we were in our 20s, he nursed a crush on my back in the day. He and his friends got together one Saturday night in high school to play the time travel role playing game Timelords, in which your character is based on yourself. The dungeon master, knowing about Jason's crush, built me into the story as a buxom tavern wench whom Jason must charm and seduce to advance in his quest. But the DM, knowing that the course of true love never did run smooth, made me a treacherous opponent who betrayed Jason's questing party. I didn't know about this until years later, after Jason and I had been dating for a few months. Anyway, all's well that ends well, and that DM was a guest at our wedding. But sometimes I worry that Jason harbors a secret resentment because wench-me bollixed up his quest from two decades ago. Discos and Dragons is the first time I remember actually liking James Franco's F&G character. Actually, it may be the first time I remember actually liking James Franco. 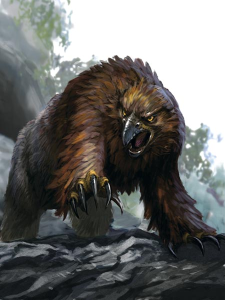 The owlbear was another monster created for D&D campaigns. It's a bear with owl parts. Let me repeat. A bear. With owl parts. 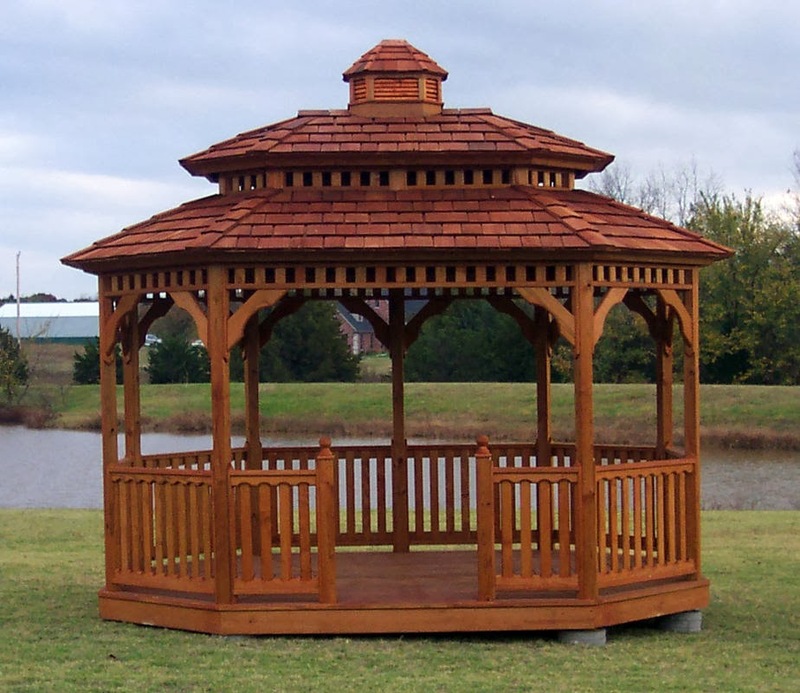 Every D&D gaming group tells the story about playing with a particularly dim opponent who — when the dungeon master describes the scenery and mentions that the members of the party spot a gazeebo off on the distance — pauses for a second, then announces. "I attack the gazeebo." What about you, dear readers? Any tender Dungeons & Dragons memories to share for the good of the group? How could I forget you, Moss?